Eastman Park is a 25-acre turf-covered park in the Southeast Corner of Windsor. It has ample parking, indoor restrooms, drinking fountains, a play area for the children and a picnic shelter to get out of the sun. For a Google Map of the Poudre River Trail, visit our Interactive Map. Eastman Park is located at Eastman Park Drive and County Road 17 (7th Street). From Windsor, head South on 7th Street and turn West on Eastman Park Drive. The park is right on the Southwest corner of the intersection. The Poudre River Trail runs along the South side of the park, South of the Pavilion. This is a great starting place for your jaunt along the Poudre River Trail, or it can be a good place to take a break on a warm day. There is plenty of parking if you are starting off from here on your journey. Here there are benches along the river, a great jungle-gym for the kiddies, flush toilets and sinks with running water, a drinking fountain where you can fill your water bottle, picnic tables for a nice lunch, a skate park for those who enjoy skateboarding, or you can just hang out in the shade on the green grass. As you go along the trail East of Eastman Park, just after you cross the bridge, you will see Treasure Island Garden. 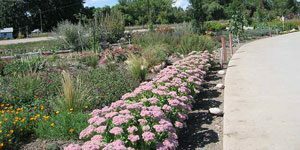 This garden is a cooperative effort between the Town of Windsor and the Colorado Master Gardeners of Weld County. This is a delightful spot with a mixture of flowers and vegetables with a dash of creativity.